If you were me looking in a mirror, this is what you would see. Brilliance! It is too bright. Look away. You are happy to meet me. This disappoints me. My presence should take you beyond mere happiness. Let me tell you the truth; you are ecstatic! How could you not be? I'm Karl Lagerfeld! Listen to me when I speak. Listen baby. Do you mind that I call you "baby"? It does not matter! It is not your place to choose such things! I'm Karl Lagerfeld! Other babies would be delighted if I were to take time out from my day and call them "baby". Do you think that you are special? No! Only I am special! Hello baby. You should do more work like that. Her eyes are two oysters, surrounded by sunshine. Fabulous! 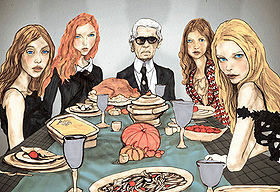 If your work was that good all the time, you would be another Karl Lagerfeld. Then I would have to hunt you, hit you with a vase and wear your skin as a bathrobe. Later, I would have cocoa. You, I like. I will buy you and put you in my pocket. There! You are bought. If you continue to please me, I will make you a cellphone out of a cocktail dress and a pair of shoes, so that you can call your mother and tell her that you live in Karl Lagerfeld's pocket. Make sure to turn off the ringer. My genius must not be disturbed! On second thought, tell your mother never to call you. My pocket is your mother now. In the bottle of fashion I am champagne. You are the bubbles that tickle my nose. You make me giggle. Look at those around you. They have turned green with their envy of you and me, Karl Lagerfeld, and my pocket with you inside it. They are so jealous that if they were soup, they would be onion. I am the spoon. Karl Lagerfeld has the right-of-way on the streets of style. Make way for fashion! You see now the power of me? I'm Karl Lagerfeld! As I swim like a hawk through this sea of babies, I call my favourite ones "baby", and they become pudding in my hands, melting like chocolate on the fire of my skin. I take their pudding and mold it, like DaVinci and that painting with the sour girl. If I was him, she would be fired! Too round. Fat makes me sick. Sick fills my inside with disgust, then I vomit and sell it as art! You buy my art. Buy it! Now! How did you get backstage? Did you tell the men at the door that you are "baby"? Why do you fill this place with lies? Are you a pirate on a ship sailing the seven seas of fashion, boarding my head and walking the crew of me off the plank of my tongue? My head is not for lies. It is for fashion! Do you think that lies built this ponytail? No! It was fashion! I have changed my mind. You are not "baby". You are undeserving. I have thirst. Fetch me a martini. Tell the bartender that it is for me, Karl Lagerfeld! He must make the perfect martini for my perfect lips. Speech from your lips is water; from mine, steam. It is not safe for you to stand so close to my boiling words. Stop! You cannot be trusted with such a responsibility. You are unclean. Hans will fetch. Hans! Bring me a drink while I show this baby the backstage of style. As you can see, this is a day of fashion. It is time for my Fall line to be shown to the people of the world. They will see it with their greedy coconut eyes and be hungry, but in mink coats and diamonds! After they witness my fashion, they would walk small dogs on leashes made from childhood memories in the park of their imagination, and seeing a happy cloud they do think of me! Here I am on Thanksgiving not eating with my beautiful guests. See how gorgeous and skinny they are? We are like works of art chiseled in egyptian marble. Delicious! No! You are too fat! Look at you. If you could see my eyes, you would see them grow dark like the fire of a burning umbrella under the rain of your shame! Get out of my sight! No, do not leave. I may grow to enjoy you, like a panda does the soft fields of clover. Just move to my left. Back. Back. More! Now you are out of my sight. Stand there and think about how you can climb out of the night and return to the light of me! 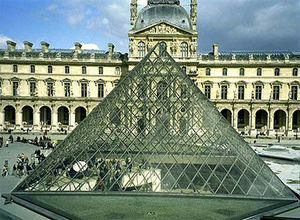 I am told that this is the Louvre. I've never been. No style! Models! If I could breed them on a farm, like gazelles in black pumps, I would. Alas, even I, Karl Lagerfeld, am not perfect enough to be me. Farms have dirt, no? Idea: perfume that smells like the farm that lives in my head! Hans! Take a note! Hans? Hans! Farm perfume. Farm. Perfume. Hans, don't make me say it again, baby. I am genius! By August, all of the babies will be smelling like gazelles on my farm. No! In the future of my dream they are sad. I have sold my farm. Even in my head, denim is not what Karl Lagerfeld would wear. The fire of my genius would char it. Delicious! If you were yogurt, I would mix you with strawberries and pour you on my head! Is that a blemish? You are not yogurt! Leave now. Now! Stand behind this one who is out of my sight. You are not to walk the runway in fashion by me! You will not be employed by me again until you are yogurt! Hans! There you are. My head is without yogurt. Bring yogurt and a single, plump strawberry. I will mix them at my leisure. Please my head! Wait. I have turned left at the fork in the road that is me. Bring strawberry and a single, plump yogurt. Hans, for my birthday I will give you a map of Karl Lagerfeld. Then you will not get lost in me! 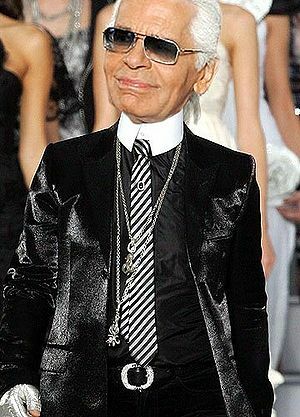 For me for you on my birthday, I will change your name to Karl Lagerfeld and you will open a house of fashion. You will call it "Karl Lagerfeld". No! You are fired! 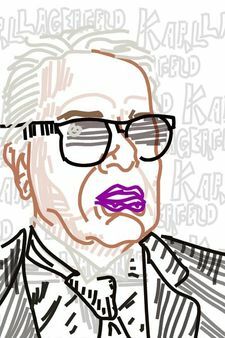 I cannot have another Karl Lagerfeld so close to me, Karl Lagerfeld. There is only one! You will change your name back to Hans. Then you must grow a sunflower in a glass of milk and give it to me on a day of my choosing. You will be a baby, then, and I will again have my Hans. This is a sketch of me, by me. I made it for me, Karl Lagerfeld. After I saw it I had to bury myself alive in my backyard, under a tuba and a bucket of flour. It was too perfect! I am sleepy! Wake me when it’s time to be breathtaking. Too late! I have tricked you. I am always breathtaking. Are you happy now to meet me? I am very busy, and am taking time out from my busy to talk to you about me, Karl Lagerfeld. <gazes at vegetable platter being carried around by caterer> In the salad of the world, I am the diced tomato. With pepper, and covered with the blue cheese dressing of me! This salad man with an ear made of phone is the celery. His celery smile fills the empty spaces of me with joy. Then he would fall off the plate and onto the floor, and his celery frown would scoop out the joy of me and replace it with weeping. All my fashion would be black, in mourning of his passing. Smile, celery! You are in my salad. Smile your celery smile! You would be the raisin. Nobody likes the raisin, but it is in my salad! It sits beside the thin wedge of cut radish and cucumber's round face and wishes that it was a celery smile. You should hydrate. Then you would be a grape, and the sun would bless you with its warmth. 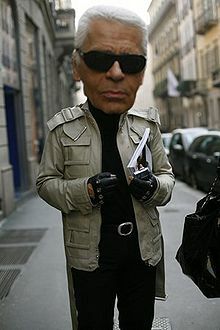 I would still be me, Karl Lagerfeld! This article was chosen as the 1st Place in the Best Illustrated Article category in the 7th Poo Lit Surprise writing competition.